Sally Kay & Fiona Woolley of Wilmslow Golf Club - winners of the Regional Final held at Kirby Muxloe. The final scores from the Regional Final of the above played on Monday 25th July 2016 can be found by CLICKING HERE. 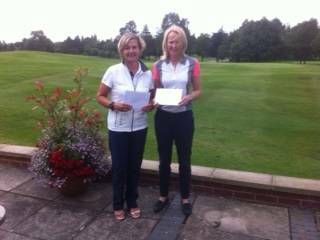 Congratulations to Fiona Wolley & Sally Kay of Wilmslow Golf Club, Cheshire and our best wishes go to them in the Grand Final of the event which is being played over the Eden Course, St Andrews on Monday 19th September 2016.